Just a note to say how much we enjoyed staying at Godre'r Graig. It had everything we needed and was in beautiful condition. I noticed that someone had packed a hand towel by mistake and have sent it back in the post. Thanks again for the use of the house. We enjoyed our week exploring the surrounding area of Wales. Thank you again for your hospitality and kindness. As promised, here are just a few of my photographs. Should you wish to use any of them please feel free. If you need them in a bigger format just let me know. Thank you for such lovely hospitality this weekend - the milk & Welsh cakes on arrival were especially thoughtful. We really enjoyed our stay in such a beautiful cottage in such a peaceful place - 'God's Country'! Caitlin loved the cows & the sheep!! We would love to come back again for longer next time!! Joanna from Chester 15th of Feb.
Just a short note to say how much we enjoyed our weekend break in your cottages at Harlech to celebrate our Ruby Wedding. Both cottages were delightful and furnished to an excellent standard and we wanted for nothing. We were particularly pleased with the home baked cakes awaiting our arrival. Thank you also for recommending The Plas for our evening meal - it was excellent. Sorry we didn'tt get chance to see you on Saturday before we left. We had such an enjoyable stay in LLofft Allan. apart from the beautiful surroundings we would never have known we were staying on a farm, it was so quiet and peaceful. We hope to return in the Spring next year. Just a short email to say what a lovely stay we had last week - as usual the standard of accommodation and the comfort was fantastic - you really do offer a lovely place for a perfect holiday - we always love our holidays with you - Dyffryn is one of our very special places even in the rain !! - we will look forward to seeing you again. some decent-enough weather to use it! 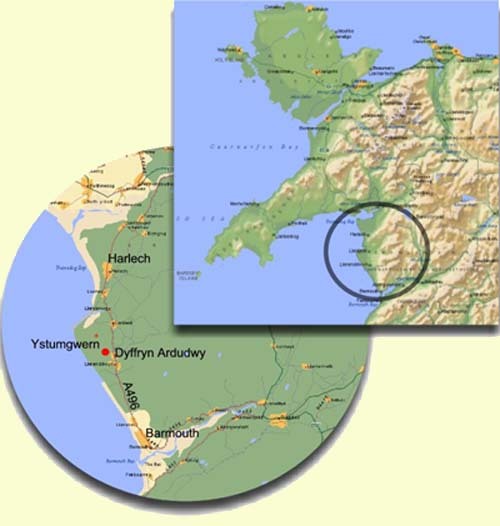 Go through the village of Dyffryn Ardudwy. Just after passing the telephone box and post box on your left hand side there is a junction where you will see the sign for Ystumgwern Farm. Turn left, follow the road down bearing to the right and you will find us at the end of the lane. If you use the postcode you will be sent down a narrow lane! Do not turn off the A496 until the junction for Ystumgwern Farm.